It’s that time of year again! The time of preparation and waiting before Christmas. Celebrate this year’s advent with a Craft BeerAdvent Calendar. A perfect gift for the beer-lovers in your life (including yourself). Happy Holidays! When Craft Beer Importers Canada first introduced their wildly popular, one-of-a-kind Craft BeerAdvent® Calendar in 2012, they never could have guessed how much joy it would bring to beer enthusiasts across Canada! In its debut year, this (adult only) BeerAdvent® calendar was the hottest gift idea the Canadian beverage industry had seen in decades. The demand for it was so intense, it sold out in a matter of days. In the following years, to supply the growing demand from the eager customers, Craft Beer Importers Canada increased their craft packs production and added a little more magic. 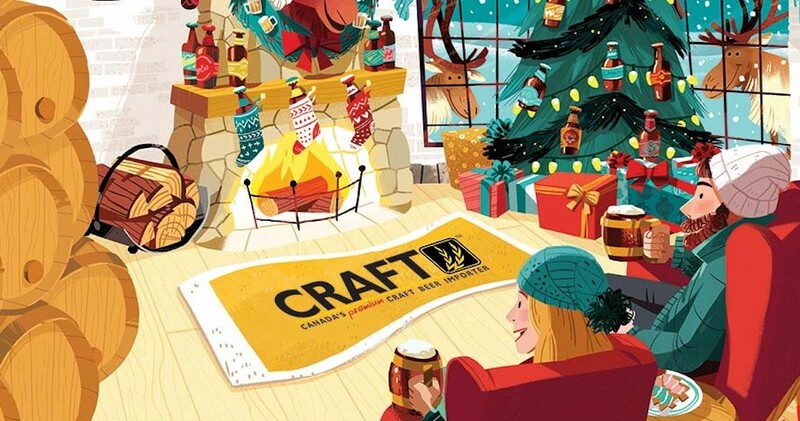 The 2014 edition of the Craft BeerAdvent® Calendar was filled with delectable craft beers from 17 countries around the world while in the 2015 Calendar, Craft Beer Importers Canada took you from ‘coast to coast’ and invited you to explore the taste of 24 remarkable craft beers. In fact, within this BeerAdvent® calendar edition were delicious beers brewed exclusively for our customers, making it the ideal Christmas gift idea for family and friends. This year, why not usher in the Yuletide Cheer with the Craft BeerAdvent® Calendar. As usual, the identities of the beers will remain a closely guarded secret and behind each removable window you will find 24 unique, hand-picked, quality crafted beers. Within this craft pack, expect to get your hands on some strong ales, imperial stouts, porters, bitters, blond ales and many more. Craft Beer Importers Canada help grow and nurture the community of craft beer enthusiasts by providing tasting notes and backstories for each beer in the Craft BeerAdvent® Calendar, updated live on our BeerAdvent® Facebook page during the countdown so you can learn about and rejoice in the rich history of the beers you are savouring. The 2018 Craft BeerAdvent® Calendar is now on sale in Alberta, Saskatchewan, and New Brunswick! The BeerAdvent® Calendar will be hitting the liquor stores in British Columbia and Newfoundland shortly. It is sold out in Manitoba and orders are closed in Ontario and Quebec. Click here for a full list of everywhere you can buy the 2018 Craft BeerAdvent® Calendar in Alberta. Not sure if you’re ready to purchase? Check out Dan Crocker’s reviews of the 2016 and 2017 Craft BeerAdvent® Calendar! Did you know that Costco also sells a beer advent calendar? This beer advent calendar includes 24 different 16.9oz and of German beer. You can pick up the Brewer’s Advent Calendar at your local Costco. Hurry! We’ve heard they sell out fast! With the Craft Advent Box, you have the ability to finally customize an Advent Calendar for your loved ones! The box comes with 24 slots to fill with beer bottles, or whatever you want! Jeremy Estes, the creator of the Craft Advent Box, is a homebrewer and an enthusiast of all things craft beer. Jeremy and his wife, Courtney, are dedicated to supporting their local markets and small businesses. With this in mind, they found a great company to manufacture the cardboard box and found a local SCAD grad to design the artwork. The Estes are focused on a family-friendly design and family safety by building a quality box that is stronger than required while not advertising alcohol in the design. The Craft Advent Box is 100% recyclable. You can also choose to keep the bottom of the box and only purchase a top for next year. Jeremy and Courtney believe in giving back. They donate 10% of all gross proceeds to a local state charity or cause. You can order your Craft Advent Box online (yes, they do ship to Canada). The Craft Advent Box is also being sold in liquor stores and Brewpubs across the Unites States. Will this booze review leave you red-faced in an angry rage? Maybe? Maybe Not? Read on to find out!